Sherman’s heard of Rendella from her bishop (who wants to excommunicate her for contentiousness. Sherman finds “the charge incredible. No one was excommunicated these days for contentiousness”) and initially dismisses the bishop’s proclaimed desire as a bit of irony. Everything about Rendella screams damaged. Her “entire left side [is] atrophied: her leg . . . shortened, her arm dwindled, her breast shrunken, her cheek and ear diminished. She list[s] and lean[s], having not two sides, but one and a half.” In conversation, her mind seems to match her body. She’s impossible to like, but that won’t prevent the wealthy Saints’ “foremost shepherd” from loving her into normalcy. Rendella doesn’t make it easy, but he doesn’t give up. Even if he comes to sympathize with her bishop’s fatalism. I find it hard to judge this story on its literary merits alone (though these are many and excellent). I suppose most of us have known a fellow Saint and traveler who was hard to shepherd. I knew a woman who, whenever someone in Sunday School might mention a difficulty they’ve experienced, would interrupt the lesson to harangue them for twenty minutes because they don’t know what suffering is like she knows what suffering is. I knew a fellow always calling around the ward desperate for scriptural justification for his anger or tales of how he was wielding said anger. Or another who hung around coffee shops and told people about Joseph Smith and hell. Serving a Rendella can take all the energy of a ward yet yield no measurable benefits. “The Christianizing of Coburn Heights” likewise does not end with a tidy happy ending. And serving those in greatest need? How rare it is that we provide them with tidy happy endings. What I find most interesting about this story is that it is told through the point of view of a man who has lived a charmed life, who has never met a Rendella, who has been sheltered from problems without solutions. Combine our time in his head with the story’s title, and Peterson is presenting us with a terribly interesting argument. One we should be compelled to respond to. So what is our responsibility to mentally ill lost sheep who will never be well? Do we return to the wilderness again and again and again? Or do we focus on the remaining ninety and nine who may fall away but who can also be persuaded to return and stay returned? The story sounds fascinating. I will go read it, then come back and comment intelligently. Okay, I just read it. It is both hilarious and heartbreaking. We all have at least one Rendella in our ward, don’t we? We actually have several in our ward. I think our job is to love the unlovable: the paranoid hoarder who berates the Scouts for trying to help her clean up her apartment so that she doesn’t get evicted; the recovering addict who brings up salacious details of his past during every Sunday School lesson; the octogenarian who has lost her sense of smell, with disastrous results for everyone in the pews around her. I’m going to have my husband read this story. He’s about to be released as bishop, and I’m sure he’ll identify. In other news, I wonder if breaking for the Lit Blitz demolished readers’ momentum for this project. Maybe I shouldn’t have paused? I’m here, I just don’t have much to say about this story. Yes, Th. Keep going. I am enjoying this series. 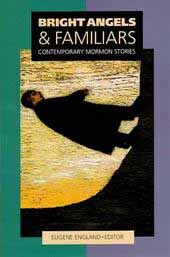 Sorry I did not re-read this to comment, but I remember liking it enough around 1994 that I copied a bunch off for the initial meeting of Mormon lit reading group I was trying to start up. And we never got off the ground, when a couple of my friends said they did not want to participate, because they thought the story was too negative/critical of Mormonism. I was flabergasted, I was young and did not realize how touch some are about keeping Mormonism and satire far apart. I’m not surprised. Anymore. By such things.